At Pediatric Dermatology of Miami, we accept most major insurance plans (see list below). Please contact your insurance company or you may call our office at (305) 667-3152 to find out if we accept your insurance plan. If your insurance plan requires you to pay a co-payment, co-insurance, and/or a deductible, you will need to pay at the time of your visit. For your convenience we accept cash, checks, Visa, MasterCard, and Discover. If you have a question related to your bill or insurance, please contact our billing specialists at (305) 667-3152. Once you have made your initial appointment, you may pre-register by downloading and printing the forms below. Please fill them out and bring them with you to your first visit. Completing the forms prior to your visit will help speed up the new patient registration process. Please note: It may take a few minutes to load the forms if you are using a slow internet connection. If you are unable to view the forms, you may need to download Adobe Acrobat for free by clicking on the icon below. 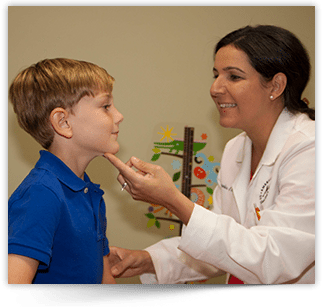 How to Choose a Pediatric Dermatologist? Copyright © Pediatric Dermatology of Miami. All rights reserved. Area pediatricians trust Dr. Mercedes Gonzalez. We serve patients in the South Florida areas of Miami, Aventura, Coral Gables, Doral, Florida City, Hialeah, Homestead, North Bay Village, Opa-Locka, Sunny Isles Beach, Sweetwater, Miami-Dade County and all the Florida Keys. When you have questions about hemangioma, fungal infection, viral skin infection such as Molluscum, chronic allergic skin reactions, chemical sensitivities causing rash or inflammation, itchy skin, hives, genetic dermatological disorders, psoriasis, Rosacea, Grover's Disease, cold sores, impetigo or other skin, hair, nails conditions, turn to Pediatric Dermatology of Miami, FL.